Background: The present era is fast experiencing rapid innovation in the genome-editing technology. CRISPR Cas9-mediated targeted genetic manipulation is an easy, cost-effective and scalable method. As a result, it can be used for a broad range of targeted genome engineering. Objective: The main objective of the present review is to highlight the structural signature, classification, its mechanism and application from basic science to medicine and future challenges for this genome editing tool kit. 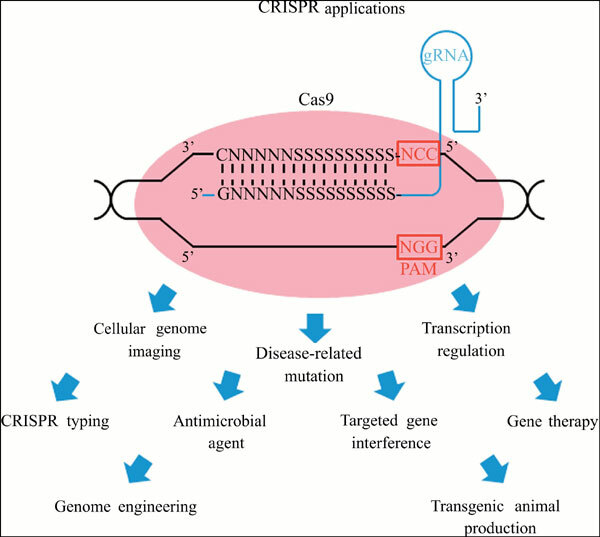 Results: The present review provides a brief description of the recent development of CRISPR-Cas9 genome editing technology. We discuss the paradigms shift for this next generation genome editing technology, CRISPR. The CRISPR structural significance, classification and its different applications are also being discussed. We portray the future challenges for this extraordinary genome in vivo editing tool. We also highlight the role of CRISPR genome editing in curing many diseases. Conclusion: Scientists and researchers are constantly looking one genome editing tool that is competent, simple and low-cost assembly of nucleases. It can target any particular site without any off-target mutations in the genome. The CRISPR-Cas9 has all of the above characteristics. The genome engineering technology may be a strong and inspiring technology meant for the next generation of drug development. Applications, Cas9, CRISPR, genome editing, medicine, technology.